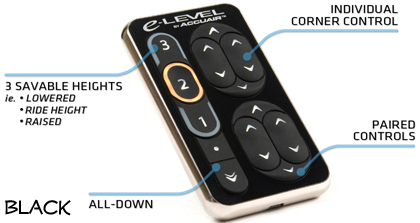 The AccuAir E Level Controller offers the the user the ability to save 3 unique vehicle heights into memory at the touch of a button using Tru-Position™ Height Sensors installed in each corner of your suspension. These three heights are then instantly accessible from the TouchPad™ or Rocker Switch Interface. The key to this technology is AccuAir’s proprietary RideMonitor™ Mode; while parked OR driving, the system will maintain the vehicle height when loading or unloading passengers and cargo or when road conditions change while driving. All of this automatic intelligence is unnoticed by the driver providing improved ride quality and handling characteristics for any vehicle with Air Suspension. The adjustments made by an AccuAir E Level controller are so accurate that each wheel maintains its height within 1/8th of an inch and prevents “cross-loading” of air springs at a higher accuracy than any other method. This is all made possible because the system calibrates to the vehicle upon installation and then learns how your air suspension behaves over time. This flexibility allows the E-Level controller to be used on any vehicle with a wide variety of valve speeds and requires NO user tuning. For the ultimate in form and function, the intuitive TouchPad™ is the top of the line interface option for the e-Level Controller. 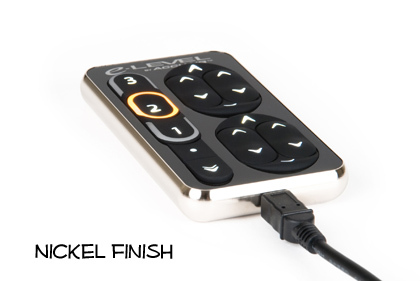 Hand held or mountable, the TouchPad™ is available in black-anodized or nickel-plated aluminum and gives full manual control over each air spring individually as well as front and rear air spring control in “pairs”. Saving and accessing your three preset heights is only a touch away and a yellow glowing ring around each button clearly indicates the current vehicle height. The “All-Down” button fully deflates the vehicle for parking. Every button offers a crisp, tactile feel and is back lit with crystal white LEDs for clear daytime and nighttime operation. A 20-ft mini-USB cable provides communication to the ECU and plugs into the TouchPad™ in either the bottom or the rear.